While winter won't arrive officially for another month and a half, there are still many regions where the freezing temperatures, biting winds, snow, sleet, hail and ice associated with the season are going to come much sooner. 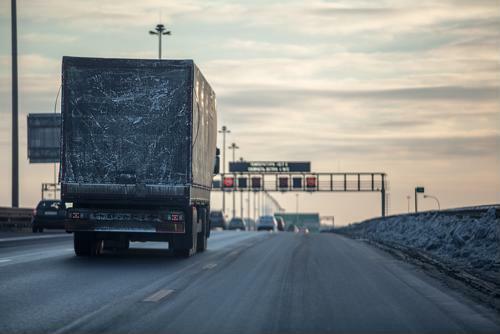 In fact, it's already happening in some parts of the country, and long-haul truck drivers in particular need to be careful on the roads as a result. A number of winter weather advisories have already been issued in states like Wyoming and Colorado, where more than a foot of snow has already fallen in some areas, according to Freightwaves. Other northern mountain states like Montana, Idaho and the Dakotas have likewise seen roads turn treacherous even if snow isn't piling up at quite the same rate. The biggest thing for drivers to keep in mind when winter weather arrives is they should keep their speeds way down, according to Smart Trucking. Staying in the far right lane and keeping a steady speed - with little to no braking or acceleration whenever possible - well below the speed limit is a good idea when conditions are poor. In general, experts say that speed should be something in the area of 25 or 30 miles per hour. The biggest threat to professional truckers when conditions like this crop up is that other drivers aren't as well-versed in how to handle their vehicles in snow and ice, Smart Trucking noted. With that in mind, truckers should always strive to maintain a safe distance between themselves and other vehicles so that another person's mistake doesn't result in tractor trailers being in an accident as well. Along similar lines, if truckers find themselves driving at the same pace as a number of other cars in a big cluster or "pack," it's wise to ease off the gas and let everyone pass when it's safe to do so. Another big hazard for drivers is winter weather can cause wear and tear for their vehicles, according to GPSTrackit. As such, it's a good idea to carefully inspect a truck that has been through some snowy or icy conditions before taking it out on the road again. That means checking antifreeze and oil levels, tire pressure, and ensuring no ice or snow has built up on the roof that could end up flying off and causing damage to other vehicles. Finally, when conditions get a little too dicey, it's wise to pull over and wait for the weather to change or plows to clear the road, GPSTrackit said. While drivers obviously want to get to the destination as soon as possible, it's better to arrive behind schedule than not at all. Generally speaking, truckers know how to handle themselves behind the wheel, but it's always a great idea to play it safe and use common sense.